Poppy and Sky are hugged by Fr. Tom Murray as he blesses them, with a statue of St. Francis of Assisi nearby, during a ceremony at St. Matthew's Episcopal Church on Saturday, Oct. 6, 2018, in Edinburg. St. Francis of Assisi, a 13th century canonized Catholic friar, who is known widely as the patron saint of animals. EDINBURG — Cody, a shy, 1-year-old Chihuahua mix, practiced his social skills Saturday morning here at Saint Matthew’s Episcopal Church. He is currently up for adoption at the Laurie P. Andrews PAWS Center in Edinburg, where adoption fees are waived for the weekend. At the church’s annual Blessing of the Animals, a Catholic tradition observed near Oct. 4, Cody met 10 other dogs and one cat who were also blessed by Father Tom Murray. The holiday celebrates Saint Francis, the patron saint of animals. 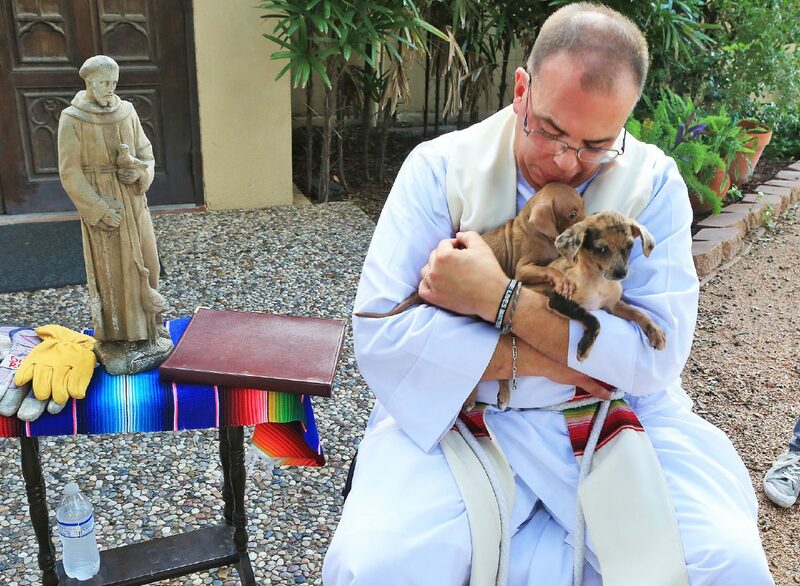 Murray, who has been a Catholic priest for almost 19 years, has performed 18 animal blessings in his career. It’s one of his favorite events of the year, though he kindly asks that participants not bring reptiles, otherwise he might get squeamish. Murray said too often animals are overlooked in daily life. The blessing is a time of year when they are remembered and acknowledged as God’s creatures, he said. The event was scheduled at 10 a.m. but actually began around 10:15 a.m., because the church runs on “Valley time,” according to Murray. The animals arrived at the church with their owners, and Murray led the group in prayer. Then, the owners lined up and received a blessing from Murray and enjoyed light refreshments. The entire event lasted about 30 minutes, but it left an impact on many first-time participants. For instance, Polly, a small mixed-breed dog, was brought by her owner, Jessica McAllen, who adopted her at PAWS. Her son, Patrick, was part of the class at Saint Matthew’s Episcopal School that gathered enough birthday money to donate $75 to the PAWS center.